Next step 3 is performed and then the relative movement between the gun and bolt is determined by subtracting the gun travel curve from the bolt travel curve. The relative movement curve can now be used to perform step 4. The loss found in this way is only about 0.012 foot per second. Since the velocity loss due to the effect of the spring constant is so small, it is not necessary to take step 5. The final curves shown in fig. 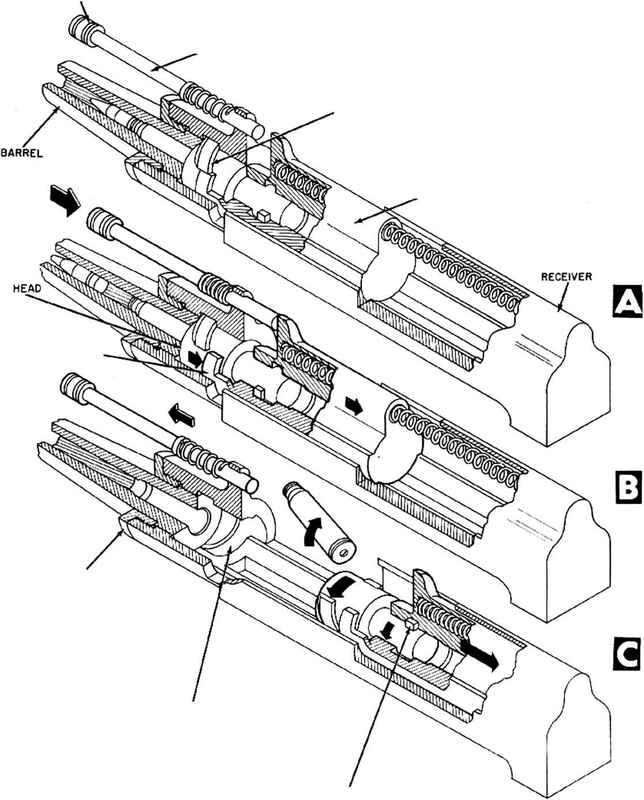 3-27 indicate that at the instant the piston strikes the bolt, the bolt velocity is 25.8 feet per second and the velocity of the gun is 7.7 feet per second. The bolt has moved 0.0507 foot to the rear and the gun has moved 0.0302 foot. The relative movement is 0.0207 foot, or very close to the allowable movement of 0.0208 foot (0.250 inch).